Micromax A120 Canvas HD Pro, the successor of the popular A116 Canvas HD is all set to make its way to the big stage. The smartphone will compete against the likes of Samsung Galaxy Note II and the LG Optimus G Pro . The upcoming A120 Canvas HD Pro will sport a 5.5" full-HD display with a resolution of 1920 x 1080 pixels, a quad-core Cortex A7 processor, PowerVR Series 5XT GPU and 2 GB of RAM. The main camera will do 13 megapixel stills and will feature a dual LED flash, while the front-facer will have a 3.2 megapixel sensor. Internal storage is rather limited at 8 GB, but you can expand it by up to 64 GB via the microSD card slot. 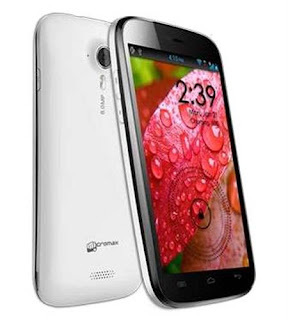 The dual-SIM Micromax A120 smartphone will run on Android 4.1.2 Jelly Bean and will be powered by a 3,000mAh battery. The Micromax A120 Canvas HD Pro is rumored to be launched on June 30 and with a price tag of $384.